It happens all the time on TV medical dramas – “You’ve had a heart attack, Mr. Phemopolis, and the tests show you are going to need quadruple bypass surgery,” says the stern-faced doctor. Cut to intense operating room scene with the doctor barking orders at the flustered nurse who is really his ex-wife, who is now dating the hospital accountant. Then the patient is back in his room, distraught wife/girlfriend/daughter at his side as he wakes up. They look at each other, she takes his hand with the one IV in it, the monitor next to the bed beeping steadily, and they smile at each other. Good TV, but not exactly accurate. On the other hand, when you read articles about heart procedures, they are sterile and cold. They tell you in clinical terms what the doctors will do, what to expect in non-committal terms like “some discomfort at the incision site”, and what you can expect your recovery time to be. What neither of these options offer are the details, and we all know the devil is in the details. The following account is one man’s true experience with heart surgery. Back in March of 2012, Rod Miller was 45 and a construction superintendent in charge of remodeling the Critical Care Unit of the Good Samaritan Hospital in Lebanon, Oregon. That morning he had an odd pain in his chest and wasn’t feeling well at work. The head nurse of the unit, whom he had come to know, asked “Are you feeling alright? Normally you’re running around here laughing and joking and dealing with your crew, but you’ve been leaning against walls and sitting down and being quiet.” He told her about the pain. She promptly grabbed him by the sleeve of his shirt and said, “Oh! Come with me. We’re going down to the ER.” Rod had no idea he was having a heart attack, but the nurse had recognized the symptoms. If you are going to have a heart attack, doing it while you’re actually IN a hospital is certainly in your favor! When they told him he was having a heart attack, Rod panicked and the symptoms got worse. Luckily it was not a major attack. No CPR was needed, thankfully, but it still did major damage to his heart muscle. After an emergency angiogram and three stents, he was told there was up to 70% blockage in some of the arteries around his heart, and eventually he would have to have more stents. Six months later he was still working as a construction superintendent remodeling a different hospital – the 4th floor of the Albany General Hospital in Albany, Oregon. He noticed he was getting really tired during the day, every day, and had started taking at least two nitro doses a day. He had one visit to the cardiologist to schedule a stress test and went back to work. The night of the cardiologist visit, he had dinner. Since he thought he was in pretty good shape and had worked hard all day, he thought he could pretty much eat whatever he wanted as long as he stayed away from fast and fried foods. After dinner, major chest pains set in. The chest pains were bad enough to rule out heartburn and send him to the ER. An EKG showed something was definitely up. The cardiologist looked at the chart and said, “Well, I guess we don’t need the stress test.” A week later Rod went in for an angiogram, and by that time he was feeling pretty miserable most of the time. Just walking up the sidewalk caused him to feel out of breath. He was pretty comfortable with the angiogram procedure since he had undergone one before and knew what to expect, but this time, the end result was unexpected. After the angiogram, he was told he would not be leaving the hospital anytime soon and they needed to do a quadruple bypass as soon as possible. He spent a couple restless days in the cardiac unit awaiting the procedure. The day before the operation, the cardiac team came in and explained what was going to happen – open heart surgery with cardiac grafting. They would also be harvesting arteries from his leg (THAT was unexpected). They explained after the surgery, he would be intubated for a couple days in the ICU, but probably would not be alert enough to know it. As a precaution, his hands would be strapped down in case he got the idea to pull it out. They gave him their standard heart shaped pillow (to hug while trying to keep your arms together) and told him he would have to breathe into an incentive spirometer which, he found out later, was not a lot of fun. The spirometer helps get the lungs back into shape after being on a heart/lung machine for several hours during the bypass surgery. It is a necessary evil because, if you don’t do it every hour after the surgery (for DAYS), your lungs never fully recover. The time between the first few hours before surgery until about three days after are a blank for Rod, with a couple of exceptions. They got him up in a majorly drugged state and made him walk around with a special walker on wheels which has handles about chest high. He remembers it being extremely difficult and very miserable, walking around with a crowd of nurses carrying various devices connected to places on his body which normally don’t have holes. On the third day (he estimates) they took out the breathing tube and off they went for another walk. The nurses helped him up from the bed since he was not supposed to use his arms at all, especially to push himself up like you would normally do. As they walked him down the hall, he vividly remembers vomiting (he had warned them! ), then being caught as he fell backwards. As a result of the doctors harvesting a vein from his leg, he had over 70 metal staples up his leg from the ankle to the groin. This incision hurt much more than the massive incision on his chest which was glued shut and not stapled like the leg. 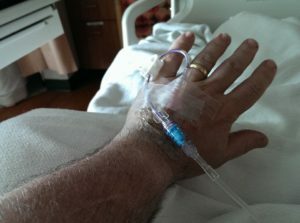 By the seventh day, Rod was feeling pretty good (except for the staples in his leg which continued to cause discomfort) and they released him from the hospital with a huge list of things not to do, and things he really should do. It took about a month for him to mostly recover, and about three months to get his strength back. There were daily walks with a stitched up leg. The first trip was about 200 yards and got gradually longer and he still does a lot of walking. Rod ended up having to get a less strenuous job, which really was not a bad thing. He currently does component estimating for a pre-engineered metal building company as well as customer service. It’s low stress compared to being in charge of entire building projects. He rarely eats fast food or anything fried anymore. When he cooks, which is daily, he uses olive oil and does his best to keep it low fat and low sodium. Every once in awhile, he allows himself a splurge on food, but moderation is the key. He also re-discovered roller skating as a fun way to exercise! It’s a lot more strenuous than one would think. Despite a healthy lifestyle choice, he has a daily regimen which includes six medications he will have to take every day for the rest of his life: Lipitor for cholesterol, Aspirin and Clopidogrel are taken as blood thinners, Losartan and Amlodipine Besylate for blood pressure, and Metoprolol as a beta blocker. So all in all when Rod looks back on the experience, it was truly the hardest thing he has ever had to do, but at least he is still here to tell the story. Rod lives in Salem, Oregon with his lovely wife, Holly, and his two daughters Natalie and Ellie. He is an avid roller skater and cooking enthusiast. He would like to thank all the doctors who have been a part of his recovery, and especially the nurse who first recognized his symptoms. Great article on the heart and the struggles Rod went through. Thanks Eileen! Like you said, I’m glad to still be here to have YOU tell my story too. I had a quintuple bypass in 2014 – the worst part for me was the drainage tubes in my chest – they were extremely painful. From cracking my ribs my back hurt so much it was difficult to breath for a few days. The nerves across your chest never connect correctly and after 3 years I still get sharp zaps in my chest from the disconnected nerves. My breasts were numb for a year and I only have part feeling in them even now. By pass surgery is a horrible yet necessary surgery – if I knew when I was younger about the pain and damage I was causing myself while not exercising and eating unhealthy food I hope I would have been smart enough to take care of myself. I’m thankful to God for bringing me through it and for my family for being at my side.